Source: CME Group as compiled by Bloomberg L.P. Note: The chart shows front-month futures prices through May 29. During the spring and summer months, gasoline futures prices are generally higher than distillate futures prices by about 5 cents to 10 cents per gallon (gal). Not only is demand for gasoline in the United States higher in the spring and summer, but the gasoline sold in those months must be summer-grade gasoline, which is more costly to produce. This year, however, gasoline futures prices have been lower than distillate futures prices in both April and May for the first time since 2013. The front-month futures price of reformulated blendstock for oxygenate blending (RBOB, the petroleum component of gasoline used in many parts of the country) was on average 2 cents/gal lower than the front-month futures price of ultra-low sulfur diesel (ULSD) in April. In May, the RBOB front-month price traded on average 3 cents/gal lower than the ULSD front-month price. Although U.S. gasoline product supplied and gross exports together are estimated to be about 2% higher so far this year compared with 2017, U.S. gasoline inventories have remained higher than their previous five-year averages for most of 2018. Higher inventories have affected gasoline’s value relative to distillate and gasoline’s value relative to crude oil (known as the crack spread). The RBOB-Brent crude oil crack spread averaged 34 cents/gal in April and 35 cents/gal in May. The last time the RBOB-Brent crude oil crack spread was lower for either month was in 2012. Source: U.S. Energy Information Administration, PJK International and International Enterprise as compiled by Bloomberg L.P. Note: U.S. data are weekly estimates for March, April, and May. ARA is the trading hub Amsterdam-Rotterdam-Antwerp in northwest Europe. Other regions in the world have also seen higher levels of gasoline inventories and, as a result, are experiencing lower gasoline crack spreads. Major trading hubs in northwest Europe and Singapore had gasoline inventory levels higher than their previous five-year averages for most of 2018 and also have had lower gasoline crack spreads compared with recent years in April and May. Factors affecting the distillate market may also explain why gasoline futures prices have been lower than distillate futures prices. Colder-than-normal weather lasted through April in parts of the United States, which led to higher heating oil consumption. Relatively high economic growth and rising oil and natural gas drilling activity could also be contributing to growing U.S. diesel demand and higher ULSD prices. In contrast to gasoline inventories, U.S. distillate inventories have fallen since January and were estimated to have fallen lower than the five-year range as of May 18. 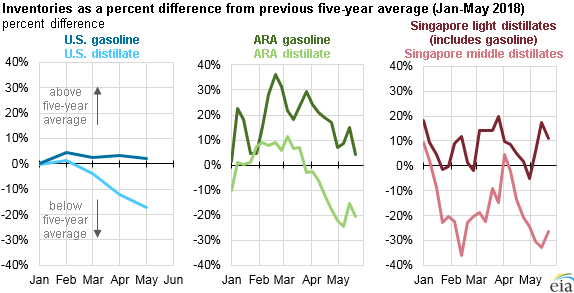 Similarly, distillate stocks in major trading hubs in northwest Europe and Singapore were lower than their respective five-year ranges as of May 24.